African Rights Commission restrains FG over IPOB, Nnmadi Kanu MARCH 11, 2018 The African Commission on Human and Peoples Rights (ACHPR) has granted a provisional stay of action against the Federal Government, asking it and other parties to put on hold further action against the proscribed Indigenous Peoples of Biafra (IPOB) and its leader, Maxi Nnamdi Kanu. The ACHPR’s ruling was sequel to the complaint lodged by the lawyer to IPOB, Kanu, Mr Aloy Ejimakor on December 14, 2017. The regional body – ACHPR – had on March 8, 2018 granted the provisional stay of further action by the parties to the dispute- the Federal Government , IPOB and Kanu, pending the determination of the complaint. 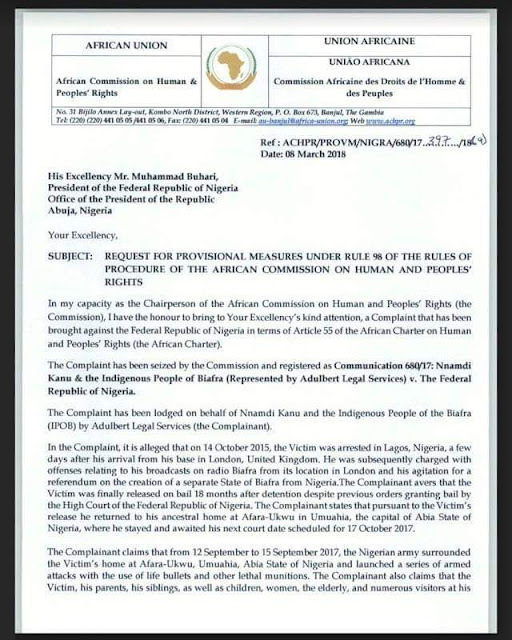 The Complaint placed three main issues for the consideration of the Commission, to wit: Nnamdi Kanu’s trial, Operation Python Dance and its aftermaths in the South- East of Nigeria including the military invasion of Nnamdi Kanu’s family home in Umuahia, and declaration of IPOB as a terrorist organization. The African Commission on Human and Peoples’ Rights, which reports to the African Union (AU) is a quasi-judicial body tasked with promoting and protecting human rights and collective (peoples’) rights throughout the African continent as well as interpreting the African Charter on Human and Peoples’ Rights and adjudication of individual complaints brought before the Commission against member States. Nigeria is a member state and has also ratified the African Charter, which all together makes it subject to the jurisdiction of ACHPR. In the ruling, the Commission also states that it has assumed jurisdiction to adjudicate on the IPOB Complaint, and gave President Muhammadu Buhari 15 days to respond by indicating the actions he has taken to implement the provisional measures ordered by the Commission. 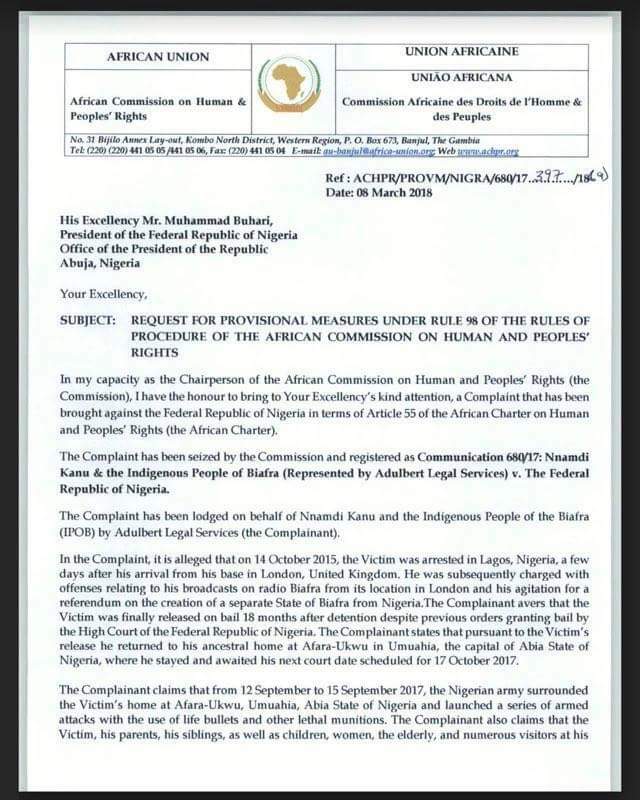 The development is to afford the Commission the opportunity to have insight reasons for government action before it reach decision as the complaint allegedly amount to gross violations of the African Charter “as well as other regional and international human rights laws and standards”.